Conor McGregor could use paper money to light his cigars for far less than it’s going to cost him for allegedly smashing a man’s smartphone Monday outside a Miami Beach, Florida, hotel. According to the Miami Herald, the former UFC featherweight and lightweight champion was arrested by Miami Beach police Monday and charged with strong-arm robbery, a felony and misdemeanor criminal mischief. A man was taking pictures of McGregor as the fighter left the Fontainebleau Miami Beach hotel just after 5 a.m. ET on Monday. According to a source, McGregor asked the man to stop. When he did not, McGregor apparently knocked the phone out of the man’s hand, stomped on it, breaking it, and then took it with him. He was arrested later in the day at a private residence in Miami Beach and was booked into the Miami-Dade County jail. The outcome of this case will follow a predictable pattern: McGregor will hire a high-priced lawyer in Florida to defend him. He’ll plead to lesser charges and probably have to do community service. Then, he’ll be sued civilly by the man whose phone he broke and come to a cash settlement with him. McGregor is the biggest active star in combat sports and regularly travels with security. If McGregor didn’t want the person to take photos of him, all he had to do was talk to his security personnel and let them handle it. He’s throwing money down the toilet by acting this way. And while the money may not mean much to a guy who has made over $250 million in the past two-plus years, it’s money that could have helped a charity. 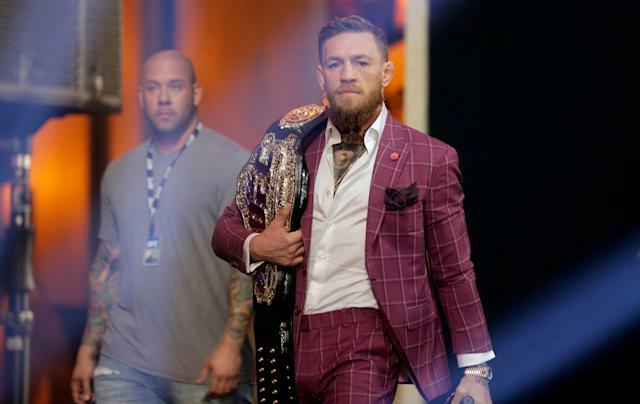 If the circumstances were the same and it was retired boxing superstar Floyd Mayweather Jr. coming out of the hotel and not McGregor, it almost certainly would have ended vastly differently. Mayweather’s security team makes the Dallas Cowboys’ offensive line look puny in comparison, and it would have quickly gotten the man away from Mayweather. There is no reason to travel with security if you don’t allow them to do their jobs. This is the latest in a pattern of issues for McGregor. He only recently finished doing community service at a church in Brooklyn to compete his sentence for throwing a dolly through the window of a bus last April prior to UFC 223 at the Barclays Center in a bid to get at current UFC lightweight champion Khabib Nurmagomedov. This is not a guy who is robbing banks, creating sexual assaults or brandishing a weapon. His behavior, though, continues to cross the boundaries of acceptable behavior. These mugshots depict a man who is foreign to those who knew him in his early days in the UFC, when he was witty and gregarious in public but classy and respectful in private. This is thuggish behavior and I don’t believe McGregor is a thug. Throwing the dolly through the window in Brooklyn cost several fighters significant opportunities on that card and easily could have cost one or more of them their eyes. When that happens, that’s when one crosses the line and becomes a criminal. He’s the father of two young children, who need their father at home raising them and not in a jail serving a sentence because he couldn’t control his temper. Being a celebrity in this society, with cameras everywhere and social media amplifying every misdeed or minor transgression tenfold or more, is a difficult chore. It’s quite reasonable for him to be unhappy with people in his face asking for autographs, wanting to shake hands, hoping to take a picture. Sometimes, the person taking the video may suspect the celebrity is drunk, or under the influence of some substance, and wants to use it to sell to TMZ to make money. There is no allegation of that here yet, but it’s a scene that plays itself out in cities like Los Angeles, Las Vegas and Miami, where celebrities go to have a good time, just about every day. It’s easy to say this, but McGregor needs to understand he’s making the money he is precisely because of the fans. McGregor isn’t making purses of up to $100 million for a single bout because he’s such a great fighter. He is a very good fighter, but he’s earning that kind of pay because of his ability to sell tickets and pay-per-views and for no other reason. He’s a smart guy who has made a series of very dumb moves. This latest one is going to cost him thousands. And if he doesn’t take some simple steps — bite your tongue and let your security personnel do their jobs — sooner or later, a small incident is going to turn into a big one. If that big incident ever occurs, McGregor will learn the sad truth that he won’t simply be able to buy his way out of trouble like he’s doing now.